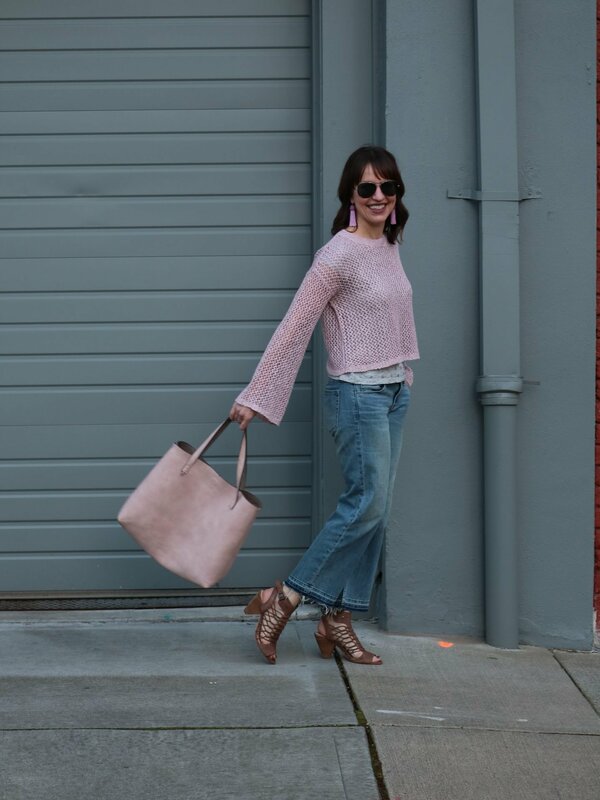 Skinny jeans aren’t going anywhere but after years of almost exclusively skinny, it’s pretty exciting to see a trend change in pants. 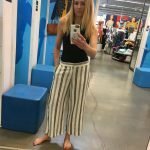 Wide leg pants have popped up here and there, but this year they’re becoming more mainstream, which means more options and better price points–two more things to be excited about! Not only that, but the trend is taking different forms such as long, cropped, paperbag waist, and jumpsuits. You can bet we’ve been eyeing this trend closely…is it for us?…can we pull it off? 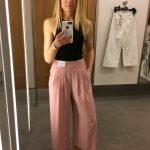 The pants look so cute on a curated IG feed under a canopy of pink cherry blossoms but really, how easy are they to style and wear in real life? Wide leg pants turn heads because they’re unique and classically sophisticated. Too much of a good thing however, can be distracting and veer into costume territory. Plus, a lot of extra fabric can create a bottom-heavy look on someone shorter or more hippy. Extra wide legs may give the illusion of a skirt and can be flattering, but we decided that to achieve more of a pant look, we preferred legs that were roomy but not voluminous. Julie finally found a jumpsuit she loves! It has a balanced fit top and bottom and the legs are a nice width. Some wide legs out there are meant to be worn low-slung, but for the most part, high-waist and wide leg seem to go hand in hand. We found that we liked to be somewhere in the middle…the extreme high waist had such a loooong zipper lol! It just wasn’t flattering. What seemed like a good idea (extra tummy coverage) ended up emphasizing the tummy and creating weird puckers on the large expanse of fabric. The key to minimizing your tummy is to bisect the area, not cover it and put a bow on top! Hello stomach! That’s exactly the paperbag waist formula though….keep reading to discover our thoughts on that trend! See what we mean? Mile long zipper and too much extra baggage in the front. Krista found a winner! 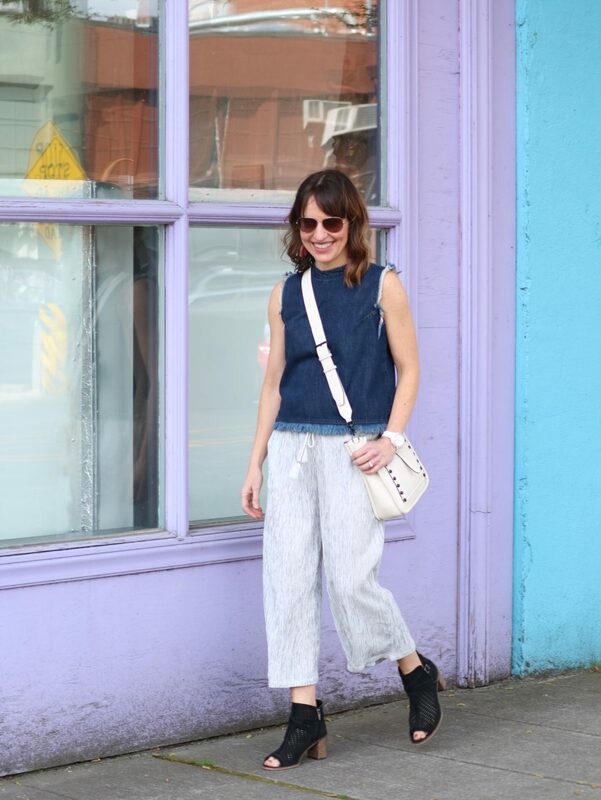 These wide leg pants are mid-rise for a comfortable and flattering fit. There’s a lot more going on with this look: more fabric, higher-waist,and a big bow to tie so it lays just right. 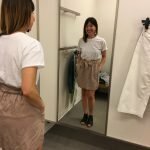 Krista tried on pants, shorts, and a skirt with a paperbag waist and finally determined that the skirt worked best for her body type. The pants made her look boxy, but the skirt gave her both a defined waist and more volume at the hips to give the illusion of curves. The high-rise paperbag can make the waist area thicker in appearance. The skirt gave a more balanced look. This paperbag waist has a lower rise so it sits more at the natural waist. This helps create curves which gives a slimming affect. 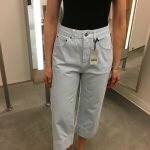 Our best success and least frustrating wide leg pant was the jean style. Back in our comfort zone lol. But honestly, the more tailored fit and thicker fabric was undeniably more flattering than the looseness of drapey fabric. This is also a dip-your-toe entry into the trend, so if you’re unsure about the look for you, try a jean style first. Wide legs with a distressed hem are a fun update on cropped jeans. Jeans give more shape and structure to your figure when you’re wearing wide leg styles. This makes them easier to style too. Our final verdict? As with most trends, we had to modify it to fit our body types and personal style preferences. Krista has a straight body type so needs a defined waist–she thought the paperbag waist style would create a waist but it seemed to do the opposite. I’m wider in the hips so extremes in leg width and waist height seemed to emphasize them all the more. A slimmer wide leg and moderate high-waist worked best for me. Like us, you may need to try on a few styles before figuring out what looks best on you. We would love to hear what you’ve discovered or questions you have in the comments below!